This is a Sponsored post written by me on behalf of Jel Sert for SocialSpark. All opinions are 100% mine. I remember as a child my Mom giving me Fla-Vor-Ice as a snack, especially during the summer. I always picked grape. Mmmmmmm. They were so tasty and refreshing on a hot day. My Mom always had a freezer full because it seemed like the whole neighborhood was playing in our yard, and she would have plenty for all of us kids to have several. Fla-Vor-Ice has been around since 1969. I love brands that stand the test of time. FVI has provided mom approved snacks for over 40 years. I am carrying on that tradition. It’s one of the snacks I feel good about giving my son (and his friends), and he loves Fla-Vor-Ice, too. Guess what his favorite flavor is? Yep, grape. He gets his good taste from me. Hey, I still love them. During the summer months I snack on a couple of those delicious freezer pops a day. Usually grape, although I love cherry, too. They’re made from real juice and at only 20 calories per serving… well that’s my kind of snack. I can feel good about giving them to my son. I’m packing them in a cooler to take to the pool with us next week. They will make a great snack while sitting by the pool. I love the convenience and portability of Fla-Vor-Ice freezer pops, and at less than $0.10 per serving, you can’t beat the price. This is why my Mom was able to offer them to the whole neighborhood… they are affordable. They come in original Fruit Flavors, Tropical Flavors and even a Sugar-Free variety. Seriously, a flavor for everyone. I plan on stocking up on them. I can store them in my pantry, and freeze them relatively quickly once I remove them from the carton into my freezer. Like my Mom, I’ll be ready to pass out my mom-approved snack at any given time. Maybe my son will do the same with his kids one day. Whether you like them as an after school snack, in-between meals, at baseball games, picnics or just anytime snacks, you can feel good about offering them to your kids. And, while you’re at it, grab one for yourself…. I approve. Oh, and Fla-Vor-Ice has a Facebook page with tons of images and information you won’t want to miss. I highly recommend you join me in “liking” Fla-Vor-Ice on Facebook. 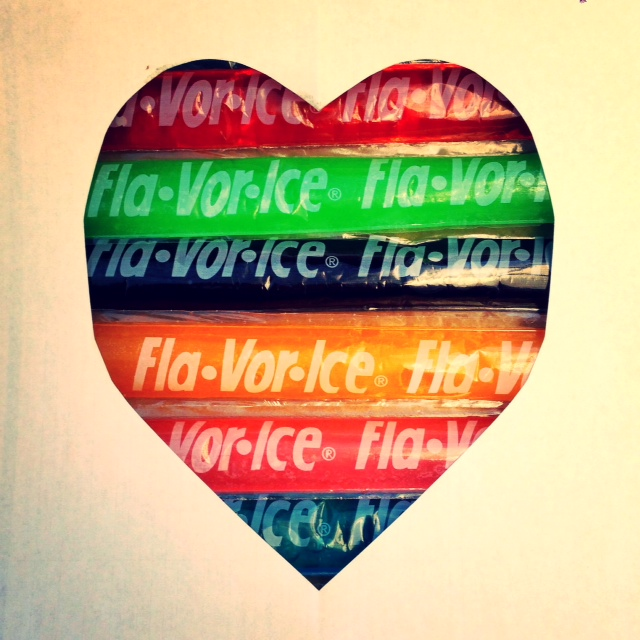 What’s your favorite Fla-Vor-Ice flavor? Oooh – I didn’t realize they offered tropical flavors! I like all of the normal flavors except orange. I bet the tropical ones would be yummy though. I love the pink pops! I remember eating these when I was a kid. My son’s school gave out Fla-Vor-Ice after his field day last week to all the student’s delight! I remember these from childhood. Juice pops for my little one though. I love Fla-vor-ice. My favorite flavor is red of course but they do remind me of my childhood summers. My kids had these for the first time a few weeks ago; they were a gift from a classmate. They LOVED them. I totally remember these! i always chose the red or purple ones! Just picked some of these up today – they are classic summer to me! I haven’t had these in FOREVER but totally grew up on them. Yum! Ooooooh! I love Flavor Ice too! Now I can give my babies too! What a perfect way to top off a morning of water park play or an afternoon in the pool. I always preferred the blue pops since they turned my tongue a funky shade. Those have been around forever. I ate them as a kid and still do.